Greetings! I’m Paula Scaffidi from www.fiberella.com. Over the last couple of years I worked with BERNINA International to develop the new BERNINA Rotary Punch Tool #45. The experience was pure joy and luck for me, and I have to admit it: the result of our combined effort has me feeling pretty indulged. BERNINA really did engineer the tool-of-my-Fiberella-dreams and I’m so happy it’s time to share it with you! Before we get too far into it some will ask, “Which BERNINA machines can I put this rotary style punch tool on?” The new rotary style needlepunch #45 (and corresponding special punch plate for your rotary model machine) is available for: artista 180/185/640/200/730, B820 & B830, aurora 435/450 and B 580. Note: A CB-style needlepunch is available for many CB hook BERNINA sewing machines. There are so many things I absolutely love about needlepunch. Where to start? 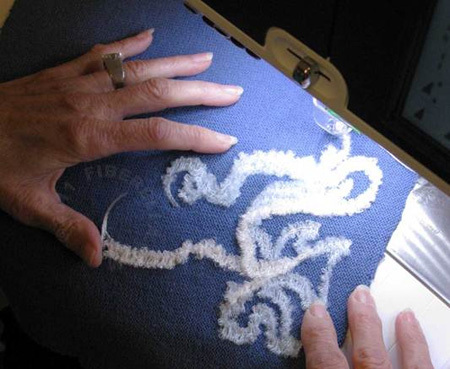 Let’s take a look at where some students began their rotary needlepunch adventure at a recent Fiberella workshop. 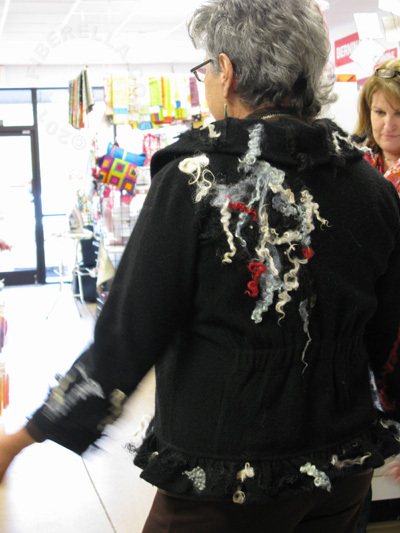 Our topic was Up-cycled Sweaters: transforming the ordinary into extraordinary. Step-by-step learners and design-driven individuals played together with abandon, learning from each other, too. So what’s the very best part about the new tool in my opinion? The way the tool lends itself to each individual. Your personality shines through! All learning styles find their muse in needlepunch. Donna has a lovely delicate heirloom touch with techniques. After building skills for a while, technique practice leads to an overall sweater design idea. 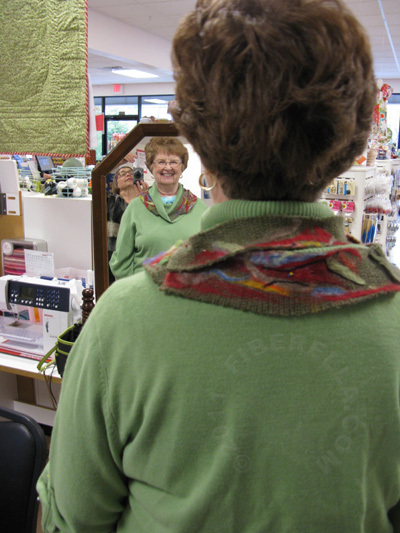 Elaine begins with a simple a design sketch to divide the space on her intended sweater; using the sketch to guide and direct practice with various sweater techniques. 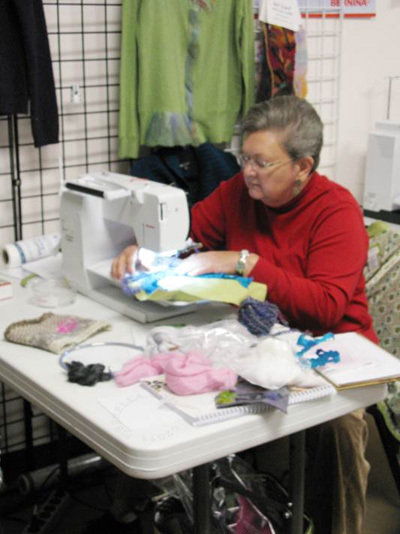 The very first worldwide in-store workshop for the new tool was held at BERNINA in Stitches in Johnson City, TN. Thanks, Teresa! Just prior to that, I presented the debut of the new tool during a lecture and vessel making workshop at The Cleveland Museum of Art in affiliation with the Textile Art Alliance. Thanks to TAA for the invitation and to Abigayle’s Quiltery for their assistance! 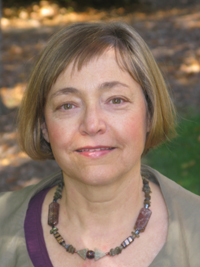 Rena reveals a Native American feeling without planning or conscious thought. We play in front of the mirror to decide where to use the wonderful experimental fabrics created while exploring color and techniques. For Carol, a bold and jazzy improvisation arrives unannounced. It’s a wild and wooly complete thought created in the moment. See more from the workshop here: http://www.fiberella.com/html/resources.html. Thanks to all of the wonderful students who decide to put aside doubts… and dive right in. It’s fun in there! Where can you begin your needlepunch adventure? Paula Scaffidi AKA Fiberella authored a 23 page color booklet that comes in the box with the BERNINA Rotary Punch Tool #45. There you’ll find simple steps for set-up based on your machine model; plus four useful broad-based Fiberella Techniques and creative suggestions to vary them. Begin creating while getting to know the BERNINA Rotary Tool capabilities. Breeze through them, scribbling joyfully in cloth. Where will it lead? More inspiration and ways to customize basic Fiberella Techniques for your interests and projects is on its way. 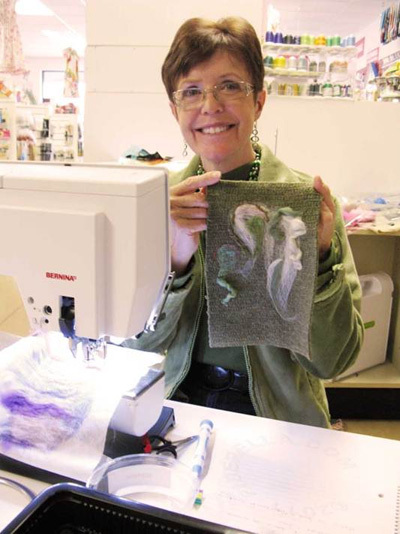 Watch for Paula’s upcoming Through the Needle ONLINE article in April 2012.